Most importantly, perhaps, Ichiro was the American League's 2001 Most Valuable Player! ... finished the regular season winning his eighth consecutive batting crown, the past seven being in Japan. His .350 average led the major leagues. Only once before has a rookie won the batting title. That was Tony Oliva, in 1964. ... won a Gold Glove award, as the league's best fielder at his outfield position. This follows seven consecutive Gold Gloves in Japan. ... had 56 stolen bases to led all of MLB. ... was the first since 1949 (Jackie Robinson) to win a Batting crown AND the Stolen Base title. ... had 242 hits, an all-time rookie record for either league, and ninth best ever (most since Bill Terry had 254 for the 1930 New York Giants). ... established an American League record for singles with 192. ... had 692 at-bats,the most ever by an AL rookie. … led MLB in multiple-hit games with 75. … had the best average with runners in scoring position  .449. … had the best average against right-handers  .362. … had the best on-the-road average  .356. … had an amazing on-base percentage of .381, reaching safely 272 times  especially extraordinary for one who walked only 30 times. … was the most difficult player to strikeout (once in every 15 at-bats). ... was the hardest to double up (once in every 231 at-bats). … received more All Star Game votes than any player in history. … established a rookie record for runs scored with 127 (second among all players in 2001). … established a rookie record for total bases with 318. … tied a rookie record for number of doubles with 34. … tied a rookie record for number of triples with 8. ... ranked among the Top 20 players overall for both doubles and triples. … established a rookie record by hitting safely in 28 consecutive games (April/May). ... had another consecutive game hitting streak of 15 games. … tied a rookie record for best fielding percentage by a rookie with a near-perfect .997. ... was voted by major league managers (AL & NL) to the All Rookie Team. Ichiro was a unanimous choice. ... was named the Mariners Co-Player of the Year (with Bret Boone) by the Seattle chapter of the BBWAA. ... received a 2001 Silver Slugger Award, presented annually by the Louisville Slugger Co. It honors the best offensive players at each position, in each league, as determined by voting of MLB managers and coaches. ... is the American League Rookie of the Year by both the Baseball Writers Association of America and by The Sporting News. Ichiro's BBWAA selection would have been unanimous if not for one imbecile  appropriately named ASSenheimer  who selfishly used his vote to dispute how Major League Baseball defines a rookie. For such gross stupidity, and for not following the MLB rules, this clown should not be allowed near another baseball ballot. Even C.C. Sabathia, the receipient of ASSenheimer's first place vote, knows better. These are his words: "The award is for first-year players in the big leagues, and Ichiro is definitely deserving of it. There's not an argument about that at all." In the 2001 ALDS series against Cleveland, Ichiro went 12-for 20 and set a new five-game batting record by hitting an amazing .600! He actually reached base two of every three plate appearances (14-for-21). By hitting .600, Ichiro established a career ALDS record for anyone  ever  who had least 20 at-bats. His 12 hits  31% of Seattle's team total  tie fellow Mariner Edgar Martinez for the most ever in a Division series (1995). The ALCS provided no highlights for either Ichiro or the snakebitten Mariners. Still, his final post-season batting average was an impressive .432. In his last 2001 at-bat, Ichiro singled and drove in a run  an appropriate ending to a season of greatness. In The Associated Press Male Athlete of the Year voting, Ichiro came in third, though he did receive seven first-place votes. Only two athletes outranked him: Barry Bonds followed by Lance Armstrong. 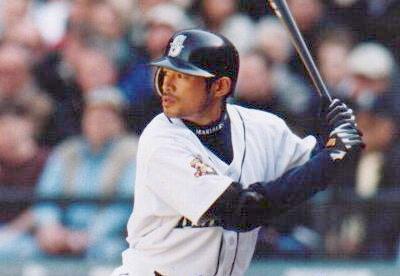 Ichiro is the first player ever to receive three Legacy Awards, winning as MVP, stolen base leader, and batting champion. He won the Seattle Post-Intelligencer's Sports Star of the Year award  winning by one of the largest margins since the audience began voting in 1974. Beyond the on-field stats ... ... Ichiro Suzuki received Japan's prestigious People's Honor Award. According to Shinzo Abe, Deputy Chief Cabinet Secretary: "He has achieved the unprecedented feat of becoming a leading hitter for eight straight years in Japan and the United States." The People's Honor Award was established in 1977 to honor individuals whose achievements give hope to society. It has been awarded only 15 times since its inception. ... Major League Baseball reports that licensed merchandise bearing Ichiro's name and likeness outsells that of any other player in the game. With 208 hits in 2002 added to his 242 in 2001, Ichiro became the first player in major league history with 450 hits in his first two years! In the history of Major League Baseball, Ichiro has the highest average number of hits per game of anyone EVER (with a minimum of 3,000 at bats). The actual number changes with every game, but Ichiro hovers around 1.5 hits per game! No one else is close to him in this department.